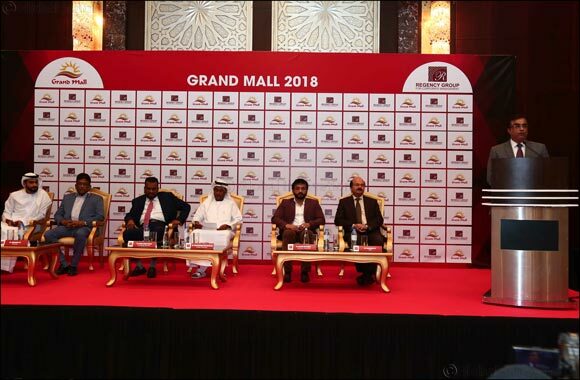 May 12, 2018 - Dubai, UAE: Regency Group, a leading hypermarket operator in the region, announced the inauguration of its 52nd outlet Grand Mall, Al Musallah – Sharjah on 14th May 2018 at 4.30 pm. The announcement was made by the Group Chairman Mr. Shamsudheen Bin Mohideen today at a press conference held at Dubai. Grand Mall Sharjah is the largest outlet of Regency Group in UAE. With a total buildup area of more than 200,000 sqft, the mall boasts huge parking space for 600+ cars in Ground and Basement level. Grand Hypermarket will act as the anchor tenant and the Mall will also have several shops with leading brands in Jewellery, Money Exchanges, Electronics & Mobility, Services, Watches and Fashion. A food court area with seating capacity of 300 guests is also ready in the mall and leading F&B operators will open their eateries very soon. Kids will have a good time at the mall thanks to the spacious kids play area spread in an area of more than 2,000 sqft. The Grand Hypermarket will feature the supermarket section in Ground Floor with an extensive fruit and vegetable section. Fresh produce are exclusively flown in from around the globe, offering uncompromised quality standards. The group’s own sourcing centers in India, China, Turkey, Indonesia, Thailand, Sri Lanka and Europe, devoid of middlemen, ensure the finest quality inventory at the best available prices. Moreover, the in-house bakery & hot food kitchen will ensure a regular supply of freshly baked products and ready to eat delicacies. The supermarket also has a first of its kind live fish grill counter and a detailed deli counter. The First Floor comprise a department store that will house all major brands in Fashion, Electronics, Household, Garments, Footwear, Toys, and Accessories. Grand Hypermarkets has been growing steadily over the years with the unparalleled support and trust of its growing customer base. The retail chain has been catering to both citizens and expatriates with a wide range of products that are much sought-after for their high quality and competitive pricing. The benefit of price efficiency that the retailer gains through large-scale procurement of products is transferred onto the end-consumer. In addition to that Grand is also providing a host of prizes & promotions to the consumers as inaugural offer in this new venture.